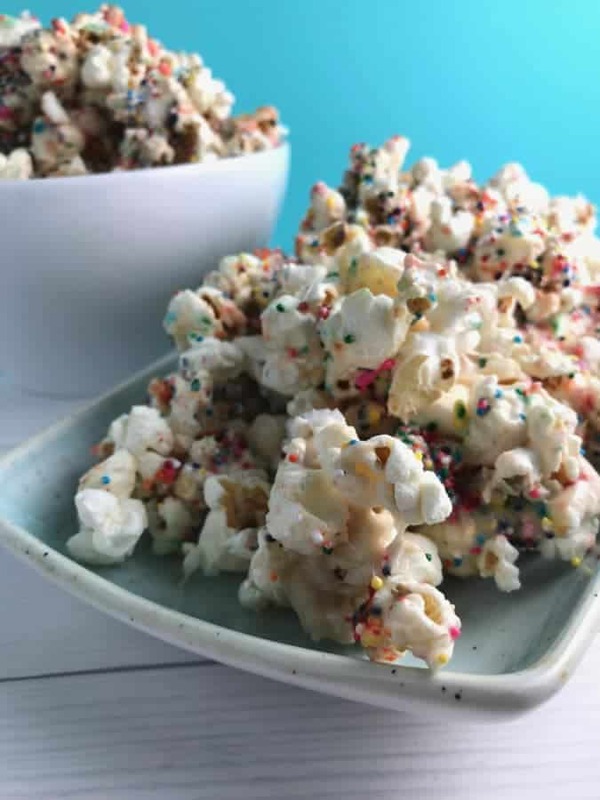 This Birthday Cake Popcorn is so addicting made with real ingredients! At MOPS we learned about the five love languages for our spouse and kids. It was awesome! I did the questionnaire with my oldest the following morning and discovered her primary love language is receiving gifts and secondary love language is quality time. So last night I bought hot dogs and buns as a surprise for lunch. She loved it. And since today is payday we bought Coco on Fandango movies yeah surprise and quality time for the whole family. What goes together with a movie than popcorn…better yet a sweet popcorn! 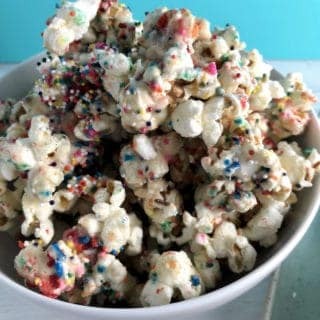 This popcorn has all the flavors of birthday cake but with no boxed processed mixes!! 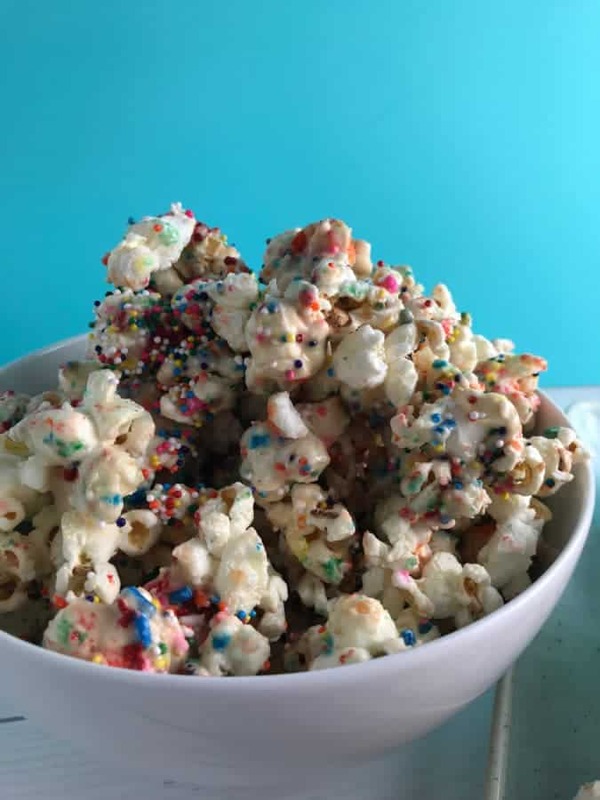 White Chocolate, marshmallows, tons of sprinkles, vanilla and almond extract and freshly popped popcorn! Pop the popcorn kernels in a large pot with a lid in 2 TBSP of coconut oil over medium-high heat. In a medium saucepan, melt the marshmallows in 2 TBSP of coconut oil over medium heat. Once melted add the vanilla extract, almond extract, and white chocolate chips. Stir until melted. In a large mixing bowl mix in stages the popcorn, marshmallows, sprinkles, and rainbow nonpareils. I do love popcorn. This looks so yummy!! Thanks for sharing. Seriously, this looks so amazing. I’m going to have to do this SOON!! This is a great snack! My girls would love to make this on one of our family movie nights. Pretty sure this would be very popular with our grandkids when it is their birthday. Why wait we could make it now and try it out. Oh my gosh, this sounds and looks amazing! I’m totally trying this recipe out. Sounds sticky and yummy! I may have to give this one a try! My kids are going to go bananas when I make this! Pinned for later! Awesome idea. Thanks! They will love it!